Since 1987, Bridging has furnished homes for more than 90,000 people who are transitioning out of homelessness and poverty. That number is astounding, but doesn’t tell the full story. The full story of Bridging comes through the stories of the volunteers, donors and clients we serve. It comes through the individuals who are starting over, and the families who are looking for a fresh start. Abdul and his wife Fadumo are not only members of Bridging’s network of agencies and caseworkers, they also know firsthand what it is like to start over with nothing. Twenty-three years ago they came to the Twin Cities from the small country of Eritrea, in the Horn of Africa. The country has been ravaged by civil war for decades. 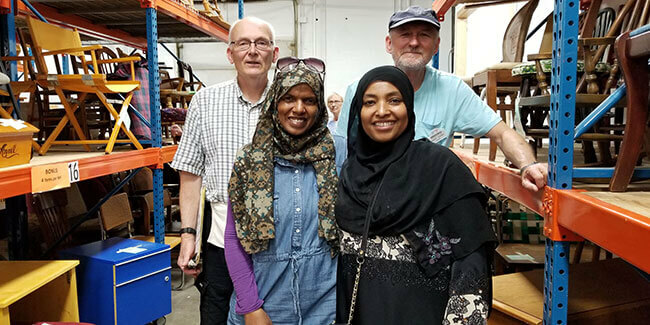 Recently Fadumo and Bosteya with the Confederation of Somali Community volunteered to shop for a family coming to Minnesota who had been living in a refugee camp in Sudan for the past 14 years.